Lobb is an India based Online Truck Booking Company and eCommerce platform related to logistics and transoportation industry. This eCommerce platform is onwed by TruckCentral Solutions Private Limited, which is a Bangalore, Karnataka based company. It is an online platform which can be utilized by the customers, transporters and truckers. It is an online platform in which a customer register when he / she need to post a load through online registration and user activation. Similarly Truck owners and Logistics companies also need to register online at the Lobb.in. In this platform customers can post their queries related to load and truck owners and transport companies can pick up and deliver the goods at the delivery point. Customers can Lobb everyday i.e. one can check the current status of load in the way through this online ecommerce platform. It is trying to offer hassle free, fast, effective and reliable truck booking and transport delivery system in India. How to register on Lobb? 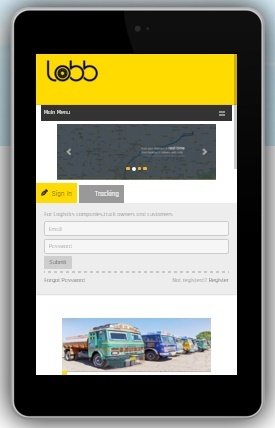 One can browse the webstie and sign up as a Logistics Company, Customer or Truck Owner. One needs to supply the basic information i.e. email, name, contact etc and profile of customers, truck owners or logistics companies can be easily created. How to get in touch or How to contact Lobb Team? One can also visit the www.lobb.in and register on the website by completing the online registration form.